Island shop offers free tattoo inspired by State of the Union. Has the indelible image of Speaker of the House Nancy Pelosi “clapping back” at President Donald Trump been been stuck in your mind? So much that you want to prominently wear it around for the rest of your life? If so, you’re in luck, and you won’t have to pay a dime. Cottage City Tattoo in Oak Bluffs is offering to tattoo Pelosi “clapping back” — free of charge. 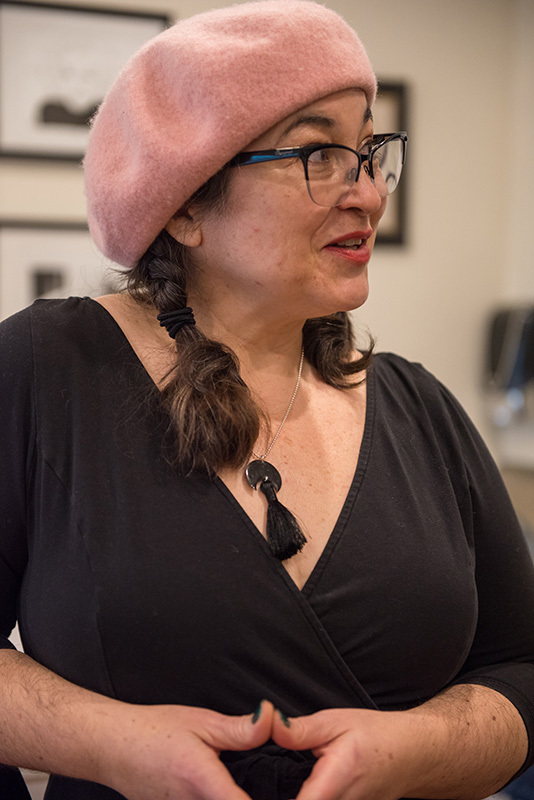 After the iconic photo of the clap was taken at the State of the Union address, Kiely and Cottage City Tattoo artist Bruce Gulick had an idea to bring more customers into the shop — offer free tattoos of Pelosi clapping back at President Donald Trump. Anyone interested in getting a Madame Speaker tattoo can do so until Feb. 21 at Cottage City Tattoo. Gulick, who is not a fan of flashy gimmicks that try to lure people into the tattoo shop, feels an artist’s work should speak for itself. 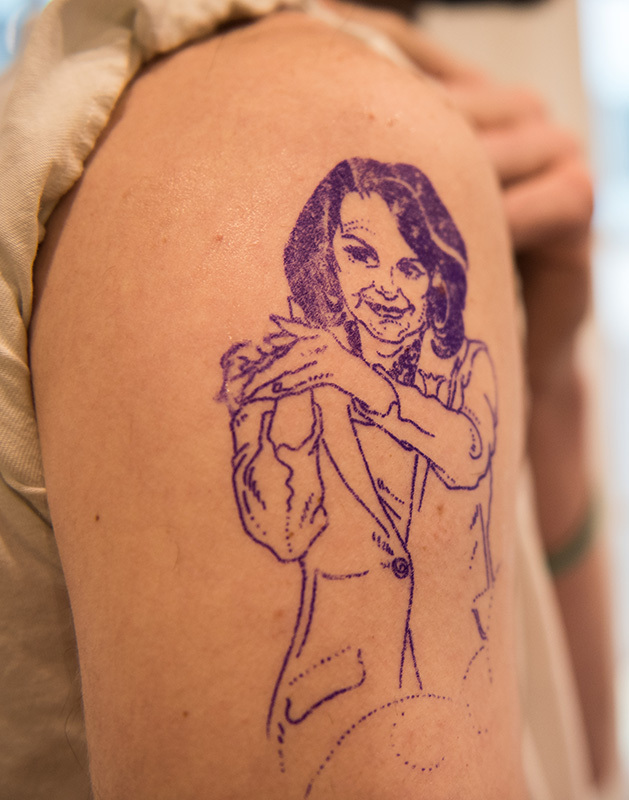 Offering tattoos of Pelosi was a creative way for the shop to promote itself without resorting to an inflatable tube man. 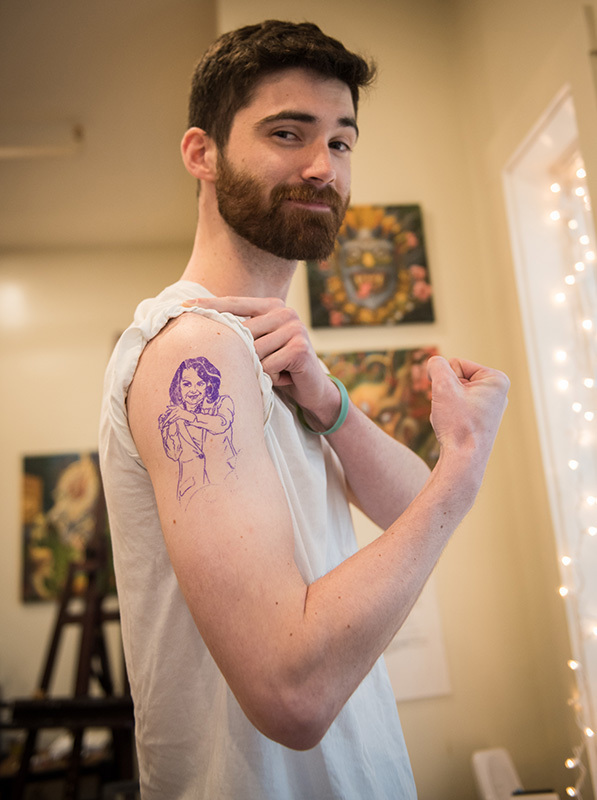 Pelosi is not the only free ink Cottage City Tattoo offers. Like many other tattoo shops, Cottage City Tattoo offers free hated tattoo cover-ups. “I think it’s unfortunate when people get bad tattoos, but you don’t have to live with them. They can be fixed,” Kiely said. Cottage City Tattoo opened last June, and is the only tattoo shop on the Island. 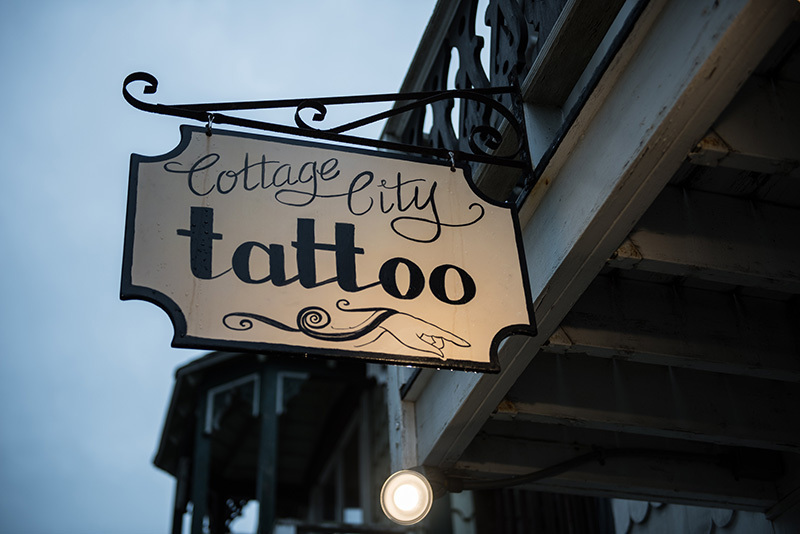 The last time a tattoo shop existed on the Island was Martha’s Vineyard Tattoo in Edgartown, which closed in 2016. Israel Ziegenhorn, a licensed plumber on the Island, was interested in opening another Island business, but wasn’t quite sure what he wanted to do. He came up with the idea of opening a tattoo shop while talking to Gulick, a longtime friend, on the phone. The two partnered up and opened Cottage City Tattoo. Gulick said the shop would not have happened without Ziegenhorn, who worked hard to build the shop and navigate the state and local bureaucracy of getting licensing, permitting, and certification. Gulick has been tattooing since 1994, after serving in the Coast Guard, getting his start in Ocean City, Md., as a freelance artist. 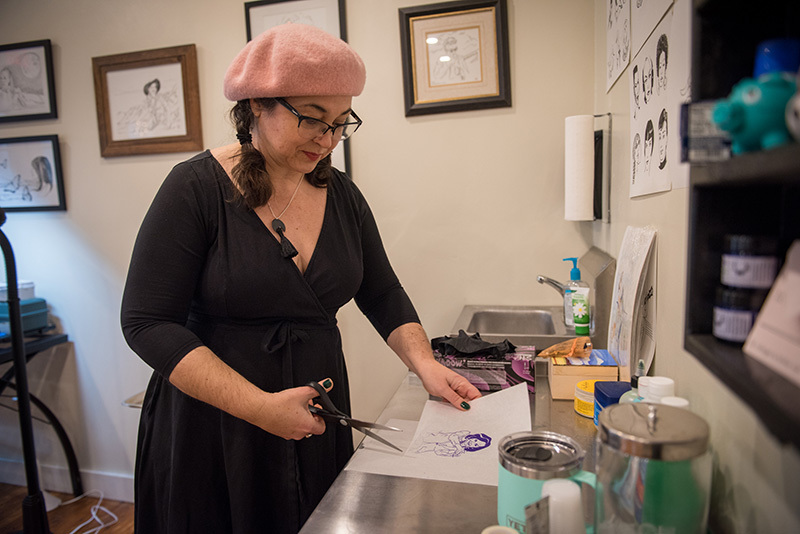 Kiely’s journey to tattoo artist began with a 30-year career as a professional illustrator. She designed her first tattoo for friends and family 27 years ago. Gulick saw Kiely’s illustrations while living in Arizona, and immediately felt she should be tattooing. Kiely then apprenticed with Gulick, and the rest is history. “She’s the best illustrator I’ve met in my life,” Gulick said. Tattoos have had a fraught history in Massachusetts. In 1962, Massachusetts dubbed tattooing a “crime against the person,” banning the practice and becoming one of the few states to make it illegal. 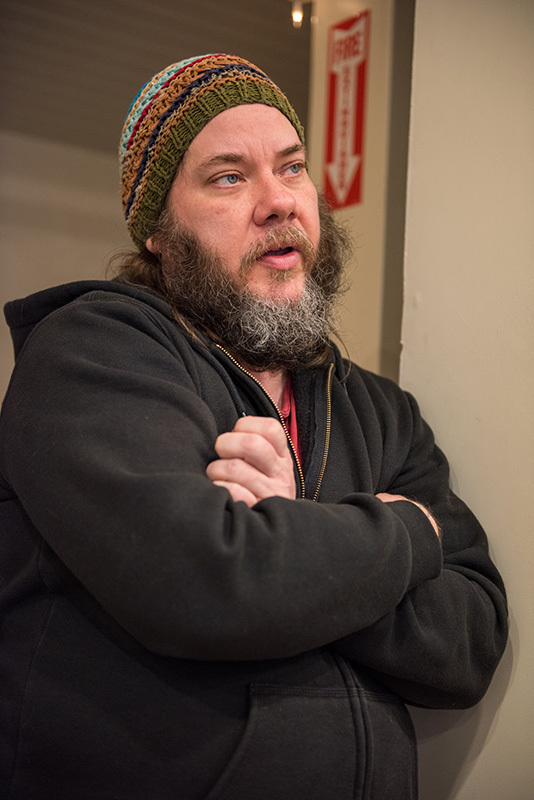 In 2000, Island resident and tattoo artist Stephan Lanphear, with some help from the American Civil Liberties Union (ACLU) of Massachusetts, took the state to court and won a ruling that overturned the ban. The ACLU made the argument that making tattoo art falls under free expression, protected by the First Amendment. Gulick knew Lanphear from tattoo conventions. The two struck up a friendship, and eventually came to work together in Oak Bluffs. 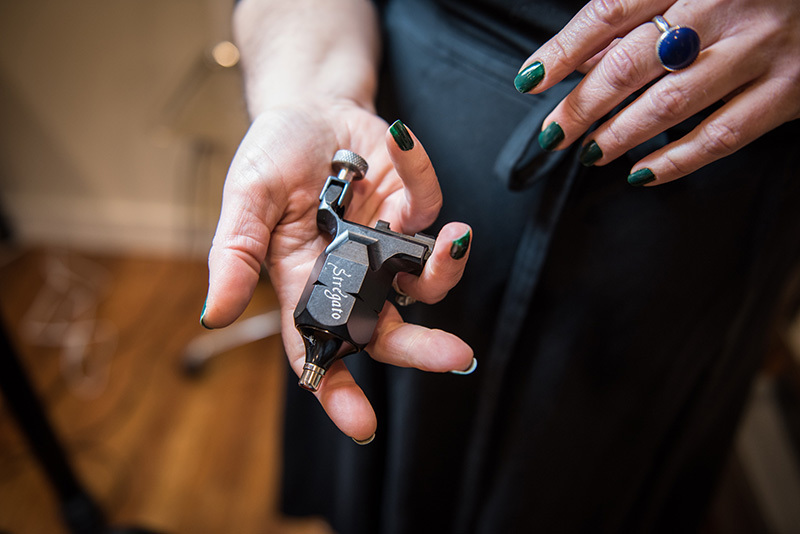 While tattoos have been legal for several years, Gulick said Massachusetts maintains strict regulations for shops, but it makes for better art and a better client experience. When tattooing was illegal, demand was high, and conditions were unsafe. Gulick and Kiely, who are both fully licensed in Massachusetts and several other states, said Massachusetts was the hardest license to get. “It’s cool to be licensed here, because it feels like you can pick up this shop design and put it anywhere in the world … it fits the highest standards I’ve seen,” Gulick said. Cottage City Tattoo is a full-service tattoo shop, offering tattoos in every style. Often clients give Kiely a theme, and she designs a tattoo for them. 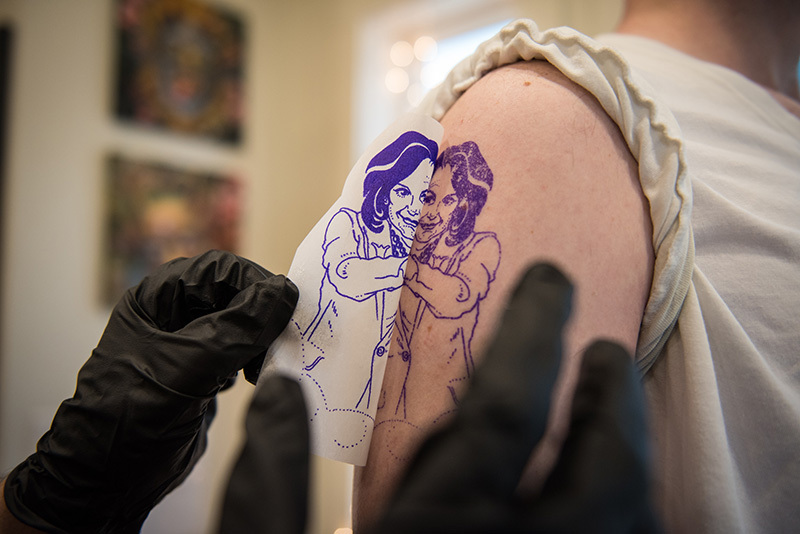 Gulick and Kiely will also sketch a design for clients, and even draw it on them with a marker to let them see what it’s like before they commit to ink. Gulick and Kiely both agree that the focus should always be on the clients — working with them to flesh out ideas and to make sure they get something the love and that suits them, all within a friendly and safe atmosphere. 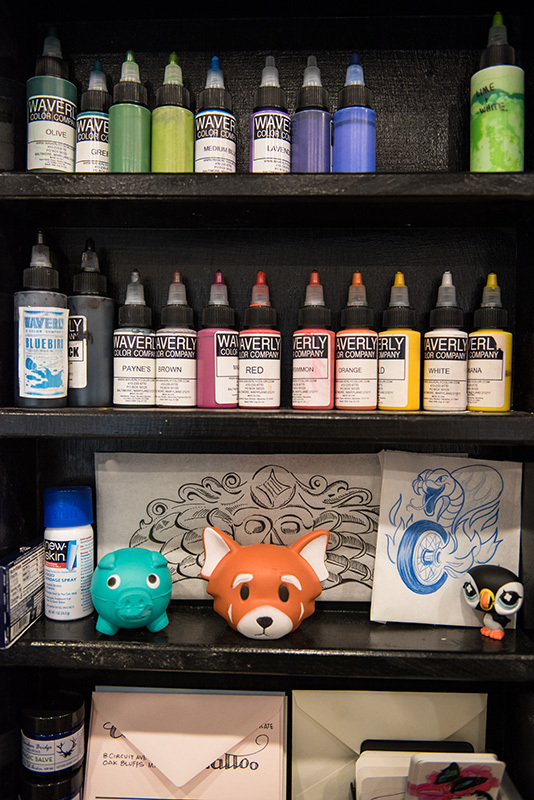 Stationed in an alley off Circuit Ave. Extension, the inside of Cottage City Tattoo was designed with comfort in mind. Pictures of both artists’ work adorn the walls, which clients can check out while reclining in leather chairs. Clients are always more interesting than the artists who tattoo them, according to Gulick.